Komodo National Park is located on the east side of Flores Island. It consists of many islands, not just the Komodo Island. There are 2 main places to actually see the Komodo, one is Komodo Island itself and Rinca Island. Though they might be spotted in some surrounding islands around as they can swim quite well. Normally you will have to live on board on a boat to have the full experience of Komodo. This area has some of the best underwater scenery in the country and also some of the best and most unique landscape. You will never get bored by the beauty of this place. Labuan Bajo Airport is your main entry and exit point. You can easily reach this town from Bali, Jakarta, Kupang, or other smaller towns in NTT. Garuda, Wings Air, Batik, and NAM Air are all flying here daily. It’s hot and humid most of the time. Best time to visit is during the dry season. When the sea is calm, less rain and water visibility is excellent. The sea will get quite rough during the wet season, hence not ideal to sail. During dry season, the grass around the island will turn to yellow-ish and it will be more dramatic to photograph. During the wet season it will turn green, hence more vibrance and colorful. Which one is better ? It’s a question that never has any good answer. We prefer to go during dry season, since it is a much better condition to sail overall, but if you want a green scenery we recommend to visit at the end of wet season, so the rain intensity has decreased, weather is getting better and you still get those greens. Anything that will make yourself at home while living on the boat. I mean most boats will have a bunk bed style rooms with AC, so it’s not bad. If you are willing to spend more you can also get a hotel style rooms. So it’s generally quite comfy already. Swim suit is a must. Comfy walking shoes or sandals is also a must. Though we recommend a good hiking sandals. You will get in the water a lot. Sunglasses is recommended and sun block is a total must. The sun will mostly be punishing. Just heat all day. So be prepared to avoid sunburn. If you are planning to bring your photography gears, just be prepared to keep them dry and protected from the sea water. Not much really. But the craftsmanship of the people in Komodo is quite famous, so they have some awesome woodworks. Flores Fabric is also quite famous, though it is not originally made in Labuan Bajo or Komodo Area. Flores Coffee is worth a try! It’s tasty and quite famous as well. Seeing Komodo is probably the least favorite thing in this trip. Because the scenery is so good. You can see mantas, but it’s not always guaranteed. And you need to be able to swim well. 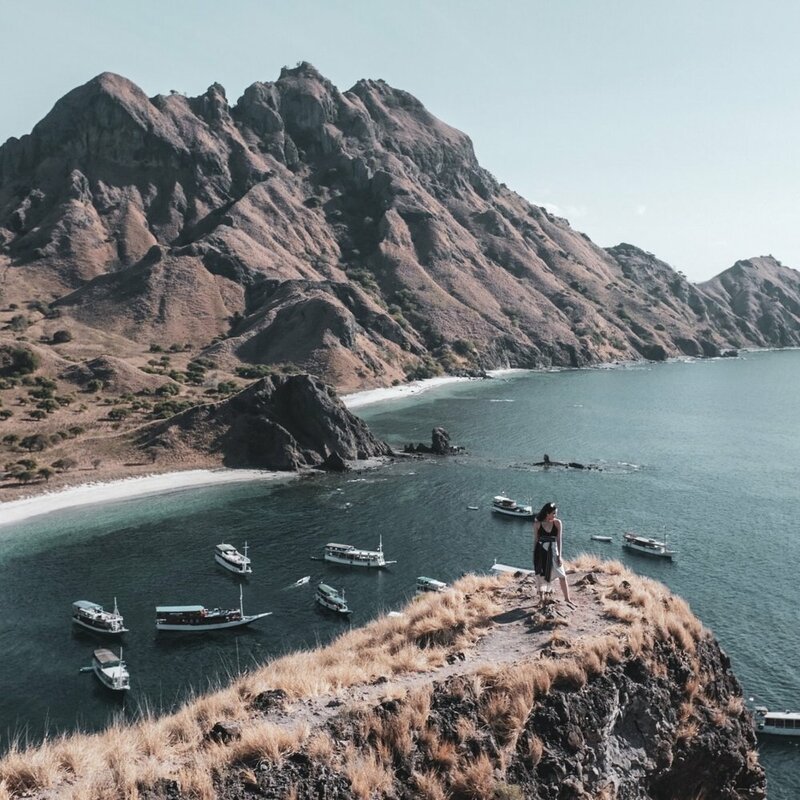 Most people said Padar is the best island. But we think Gili Lawa has the best vibe. There are a lot of pink beaches there. We like to find one with the least crowd.